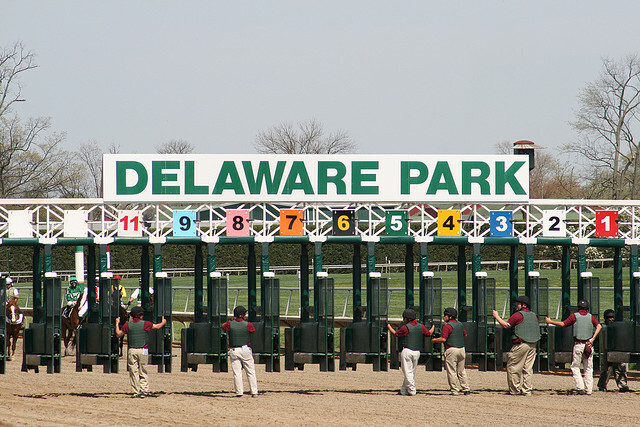 A small field goes forward at Delaware Park for the crown jewel of the meet. Only one horse in the field has raced at the challenging ten-furlong distance. That, of course, is the ever-so-classy Princess of Sylmar (#6, 1/1), who won the Grade I Alabama at Saratoga in a career-best performance last year. On her best, she should defeat this field. But will she be on form? Her last race was a month-ago — the grueling Ogden Phipps against Beholder and Close Hatches. Just a small regression off that effort makes her vulnerable in here. Belle Gallantey (#1, 10/1) could benefit from an easy pace scenario. She held her own against Princess of Sylmar, Beholder, and Close Hatches last time out, although you have to wonder whether that race took too much out of her. She’d need to be improved still to upset today. Flashy American (#2, 7/2) picks up excellent local jockey Alex Cintron. She’s won 8 times, and on her best, it’s possible. But this seems a bit too hard for her. Molly Morgan (#3, 3-1) is getting some buzz after her GII romp last time out. She certainly figures and could be rounding into career form. Gamay Noir (#4, 10/1) steps up in class after a nice speedy win over the Delaware surface. Might not be enough pace in here for here, but she did close nicely in her last two without much pace. She should be good value underneath Princess of Sylmar. Bryan’s Jewel (#5, 15/1) rates only a longshot chance at best, and only if she relishes the long distance. There’s the risk that Belle Gallantey gets an easy lead to upset the field or that Molly Morgan continues improving. But, depending on price, I’m most interested in Gamay Noir, depending on the price in the exacta and win pools. Possibly to win, and also under Princess of Sylmar in a straight exacta. I’ll be covering the race live on twitter @alldayracing, so tune in to find out the final plays based on the odds.